According to Traditional Chinese Medicine, The Five Elements, or Five Phases, are aspects of Qi. These are Wood, Fire, Earth, Metal, and Water. Each element represents certain group of body organs that maintains life. 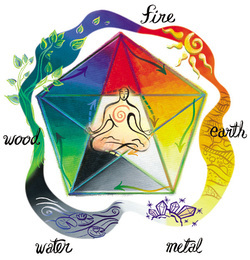 In the poetic language of the Five Elements, health is a harmonious balance of all the elements. The Qi of the elements waxes and wanes in daily and seasonal cycles. In order to maintain good health, we must replenish the Qi through foods or exercises. HKIII Bamboo Salt is originally from Korean traditional remedies with thousand years’ history. The bamboo salt is manufactured based on The Five Elements theory. The natural sea salt (water) from the western coast of South Korea is filled into 3 years growth’s bamboo (wood). After sealing the bamboos’ opening with red clay (earth) from the deep mountain. The bamboo salt is then well arrange into a metal trolley (metal) and move into the burning furnace for high-heat roasting for 6-8 hours (fire) by using pine wood and pine resin as burning materials at the temperature of 800ºC – 1500ºC. The process is repeated for 8 times. During the ninth roasting process, the 8 times roasted bamboo salt is put into a metal furnace (metal) and the roasting temperature is increased above 1500ºC. The bamboo salt is melted, cooled, solidified and grinded into granule or powder form for consumption. The HKIII Bamboo Salt is an ideal food to replenish the Qi because it has manifested the positive energy of The Five Elements through its unique manufacturing process.